Dealing with discomfort– Over-the-counter pain medication and orthodontic relief wax will help alleviate any mild soreness and discomfort following placement o braces and orthodontic adjustments. Another effective remedy is to chew sugar-free gum, as this increases blood flow which helps reduces discomfort and can also encourage the teeth to align quicker. Fixed braces – Braces comprised of brackets which are affixed to each individual tooth, and an archwire which connect the brackets. The brackets are usually made of metal, ceramic, or a clear synthetic material which is less noticeable to the naked eye. After braces have been applied, the child will have regular appointments to have the braces adjusted by the the orthodontist. Orthodontic elastic bands are often added to the braces to aid in the movement of specific teeth. All of the above diagnostic tools will be used to diagnosis and develop a customized treatment plan for the patient. Next, the orthodontist will recommend a custom orthodontic device(s) to gently move the teeth into proper alignment. This orthodontic appliance may be fixed or removable. Most commonly, traditional fixed braces are affixed, which utilizes individual dental brackets connected by an archwire. 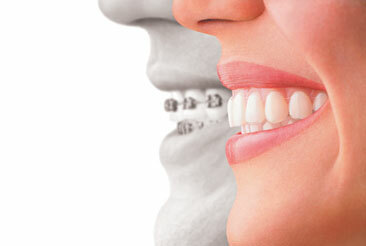 Lingual braces are also fixed but fit on the inside (tongue side) of the teeth to make them less visible. When the teeth have been correctly aligned, fixed braces and removable devices will be removed and discontinued. The most cumbersome part of the orthodontic treatment is now over. The orthodontist will next create a custom retainer. The goal of the retainer is to ensure that the teeth do not begin to shift back to their original positions. Retainers need to be worn for a specified amount of time per day for a specified time period. ; During the retention phase, the jawbone will reform around the realigned teeth to fully stabilize them in the correct alignment.